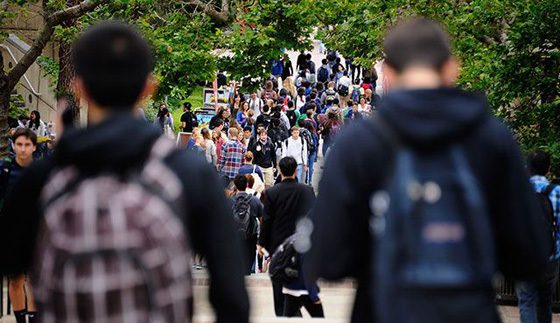 The number of students enrolled in higher education will continue to grow between 2010 and 2021, but colleges and universities will not see the sharp increases of the previous 14 years, according to a new study by the U.S. Department of Education. The report, Projections of Education Statistics to 2021, predicts that total enrollment in degree-granting institutions will rise by 15 percent from 2010 to 2021, down from a 46-percent increase from 1996 to 2010. The data show enrollments continuing to grow, but at a slower pace, with approximately 21.6 million students enrolled in fall 2010, up 2.8 percent from a just under 21 million in 2009. Both public and private institutions are expected to see enrollment increases of 15 percent in the coming years. That represents a more substantial change for private colleges, which experienced an increase of 81 percent from 1996 to 2010, than for public institutions, which saw enrollment grow by 36 percent over the same period. The gender gap among students narrowed slightly in 2010, with men making up 42.8 percent of all postsecondary enrollments, compared to 42.6 percent in 2009 and 2008. That slight increase may have occurred because men were more likely to lose jobs in the recession than were women. But enrollment of women is expected to continue to outpace that of men, with women expected to see an 18 percent increase, compared with a 10 percent gain for men. According to the report, the nation’s colleges and universities will also see varying increases among different racial and ethnic groups. The number of Hispanic students is expected to climb by 42 percent, black students by 25 percent, and white students by just 4 percent. Enrollment of Asian/Pacific Islander students will increase by 20 percent and American Indian/Alaska native students by 1 percent. Age also emerged as a variable in enrollment gains, with growth slowing most for students ages 18 to 24 with gains of 10 percent expected between 2010 and 2021. Enrollment for those ages 35 and older are projected to increase 25 percent over the same time period. 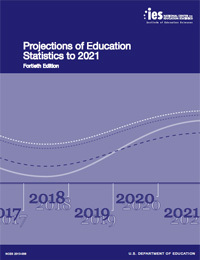 To read the full report, Projections of Education Statistics to 2021, visit the National Center for Education Statistics at www.nces.ed.gov.